There is plenty of evidence to show that this site was occupied in the Roman-British period. With the area of excavation being confined to the church building the whole exposed remains of the villa present only a small fraction of what was there. With such limited evidence it would be presumptuous to attempt to predict the general plan. Suffice it to say that there appears to have been a 1st - 2nd century North-South building with a later East-West wing. One phase may have been an aisled hall. The foundations in the field to the east of the villa suggest a range of outbuildings possibly agricultural. However, the foundations to the east of the church site have now been ploughed out. 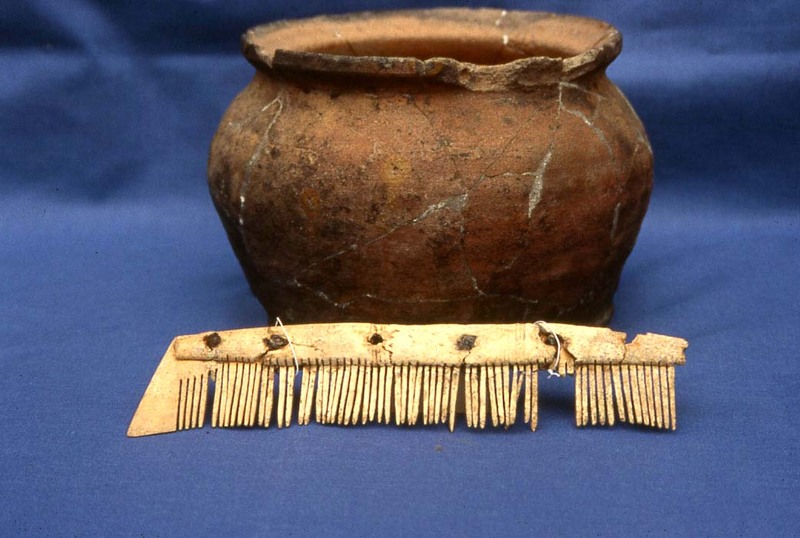 From the sequence of findings dated to the second half of the first century AD it would seem possible that there was continuity of occupation form the late Iron Ages settlement to the Roman type building. The transition probably took place towards the end of that century. Three or four phases of the villa can be recognised and there are finds dated to all four centuries of the Roman period though this does not necessarily imply a continuous occupation. There is nothing dated later than AD 350. It is probable that the ruins of the villa attracted the church builders as well as the suitability of the central position it occupied. The modern interpretation of the name Flawford as deriving from something like Fag-flor or Fah-flor, meaning coloured stone floor, ties in very neatly with the discovery in 1970 of part of the tessellated floor at the east end of the nave. Inside the angle formed by the the north-south and the east-west walls. A great many tesserrae were found along with small areas which had survived more or less intact. The construction of the floor consisted of a thin bed of red clay 0.09m thick above which was a layer of mortar 0.4m thick. the tesserae were embedded into this mortar. These were of grey limestone and red brick about the size of a 0.25 cube and seemed to form a regular pattern. To the west there was an area of smaller tesserae consisting of white limestone and samien cubes. This was completely messed up. 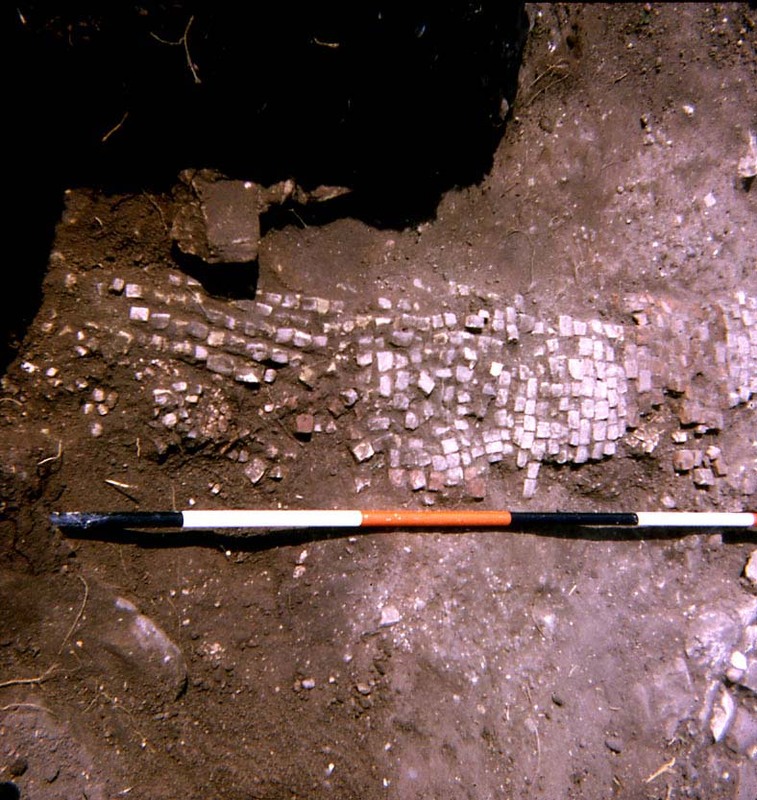 A light scattering of tesserae were found to the north of the east-west wall. To the east of the north-south wall. Amongst the latter were large tesserae of dark grey limestone which was not found elsewhere on the site. It is not possible to say whether they represented a separate floor or that they had speard form the main area. On the evidence of the samien floor it is unlikely to be earlier than 160AD. Flawford Villa is one of only four villas found in Nottinghamshire to have a tessellated floor. One of the others is Glebe Farm Villa at Barton-in-Fabis which is only 4¼ miles west of Flawford. Tesserae are small squares of stone or glass which make up a mosaic.